Introduction: Primary hyperaldosteronism may be caused by adrenal hyperplasia (nodular [NH] or diffuse [DH]) or functional adenoma [FA]. We compare response of hypertension and hypokalemia for both pathologies following laparoscopic adrenalectomy. Methods: All adrenalectomies performed for hyperaldosteronsim at a single institution were retrospectively reviewed. Hypertension / hypokalemia were considered improved in patients with reduction in post-operative antihypertensives and/or postassium supplementation. Results: From January 1999 – July 2008, 64 adrenalectomies were performed for hyperaldosteronism. Sixty-three were laparoscopic, one required laparotomy for concomitant partial gastrectomy. History of admission for hypertensive crisis occurred in 32% NH/DH (n=9) and 29% FA (n=10). Hypokalemia affected 57% NH/DH (n=16) and 65% FA (n=22). Aldosterone:renin ratio averaged 71.43 (5.62 – 1488.5). When no mass was seen on imaging, preoperative adrenal venous sampling was performed (n=30). In these patients, adjusted aldosterone:cortisol ratio averaged 15.67 (range 0.56 – 48.47). Pathology included NH (n=25), DH (n=3), FA (n=34), and normal gland (n=2). Post-operative follow-up was available for all patients, averaging 31 weeks (1-186). Improvement or resolution of hypertension occurred in 71% with NH/DH (n=20) vs 91% with FA (n=31), p=0.02. Resolution or improvement of hypokalemia occurred in 80% with NH/DH vs 90% with FA, p=0.63. Conclusions: Adrenalectomy for lateralizing hyperplasia or adenoma results in improvement of hypertension and hypokalemia in over 70% of patients. 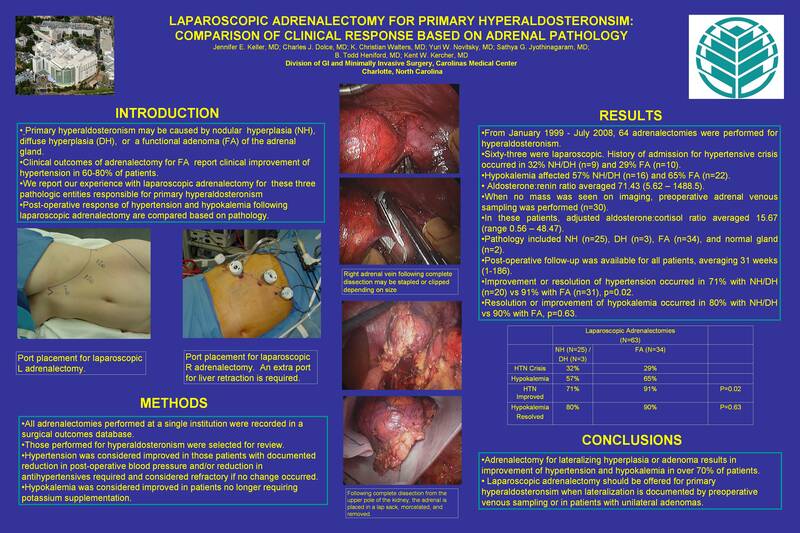 Laparoscopic adrenalectomy should be offered for primary hyperaldosteronsim when lateralization is documented by preoperative venous sampling or in patients with unilateral adenomas.